Sugarland returned to the stage on Thursday for their first performance since a stage collapse at the Indiana State Fair left five people dead. The Grammy-winning country duo asked its Albuquerque audience for a moment of silence in honor of those who were wounded "and the beautiful lives that were lost." Sugarland members Jennifer Nettles and Kristian Bush were minutes from performing at the fair in Indianapolis last Saturday when winds up to 70 mph knocked the massive stage onto the audience. Four were killed instantly, another person died later. About four dozen others were hurt. On Thursday, the duo was joined on stage by their entire crew as Nettles sang "Love," from their 2008 "Love on the Inside" album. Then they took a break and promised to return for a professional show that would begin the healing through "the power of music." 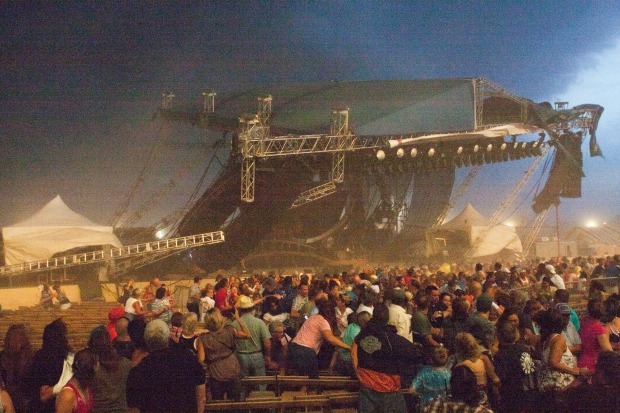 Because the band's elaborate set and instruments were destroyed in the stage collapse, Sugarland performed in front of the basic black shell of the pavilion stage, with just lights and a little smoke. They used new instruments that were delivered to Albuquerque earlier in the day. "This incredible machine is more than a tour and more than a set," the group said in a statement on their website. "We have always celebrated music as a healer. While music cannot change the events and losses at the Indiana State Fair, it can hopefully serve as a ritual and a balm to provide comfort and facilitate healing in this time of great sorrow." Nettles and Bush weren't injured in Saturday's accident. Their manager said earlier this week that a decision by their touring manager to hold them back after seeing the sky likely saved their lives, the Associated Press reports. "While we all scattered to our given families for their comfort, the trauma we experienced together binds us in a unique way that we share only with each other, and those who were there,” the band said in a statement. “There is healing in our being together. There is healing in our working together." The band plans a private memorial for the victims in Indiana.